We have tried growing a small garden for the past couple of summers. Last year was mildly successful. We got quite a few tomatoes, a few chile peppers, and fed some very young basil, cucumber, and zucchini plants to the bugs. This year we have had a bit more successful. The tomatoes have been gorgeous; the basil managed to grow to a size that can handle the bug infestation better. Since Abundant Harvest is keeping us up to our ears in zucchini and cucumbers, we felt no need to try to grow those. We did add tomatillos this year. So far, the plants are filled with tiny little fruits that seem to be growing steadily, although slowly. The plants are gorgeous, though. They are leggy and bright green and have adorable little yellow flowers all over them. I don't mind that they are using up valuable garden real estate that could have seen a couple of rounds of something else. Besides, how could I possibly use up a couple of rounds of something else? This week we seemed to have about a million tomatoes come ripe all at the same time. I went ahead and brought them all in, combined them with the tomatoes that I got in the AHO box, and made a batch of pasta sauce for the freezer. There is something amazing about picking the tomatoes, and then while they are still warm from the sun, washing and chopping them up. It's lethargic to work with something that fresh. I think I may never have to go grocery shopping again. For the rest of my life. Pasta sauce isn't difficult. It's just a matter of pureeing the tomatoes, adding some spices, and letting it all simmer and meld for a long time. Plus, it sure smells good while it simmers for a couple of hours! I cannot vouch for the acid level of this sauce, so if you want to can it you need to do it in a pressure canner. Unless, of course, you know a lot more about food safety than I do. As for me, I just put it in the freezer. 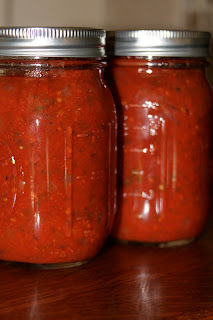 I based this recipe on the one in Animal Vegetable Miracle, and it can easily be multiplied to make a big batch of sauce. 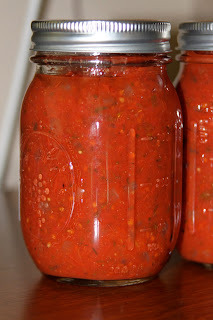 It is so easy, but long, that you might want to make a whole bunch while the tomatoes are ripe, to use all year. Saute onions in a large pot, until soft and translucent. Add pureed tomatoes and all of the seasonings. Bring it all to a boil and then reduce to a simmer. Simmer on low heat for about 2 hours, until the sauce is a thickness that you like. Stir occasionally (more frequently toward the end). 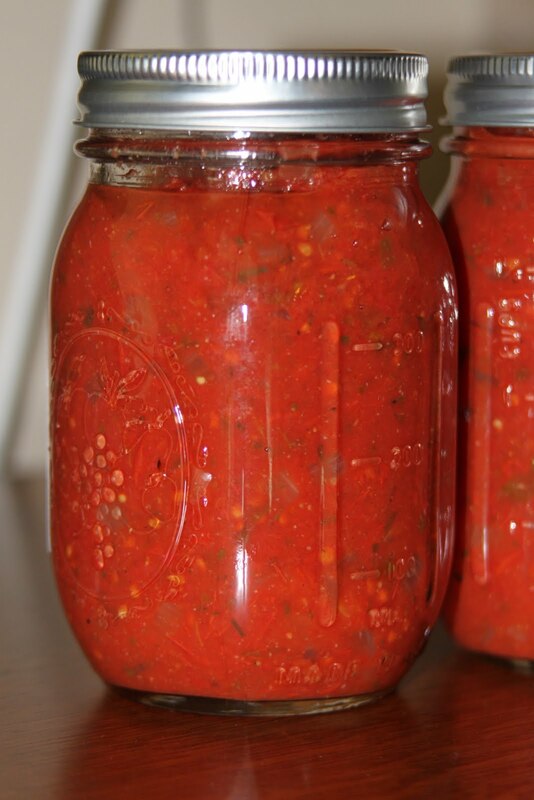 Pour into jars or freezer bags and freeze (or refrigerate if you plan to use it soon). What would you think about using fresh tyme and oregeno versus dried?